SYRACUSE, N.Y. — The City of Syracuse has relieved one of its officers from his enforcement duties following a civil challenge presented by two evangelists in federal court. According to documents filed by the city, Sgt. Michael Long of the Syracuse Licensing Department, who identified himself as “the end all” and “an army of one,” is no longer allowed to handle matters pertaining to the enforcement of the city’s noise and pamphleteering ordinances. 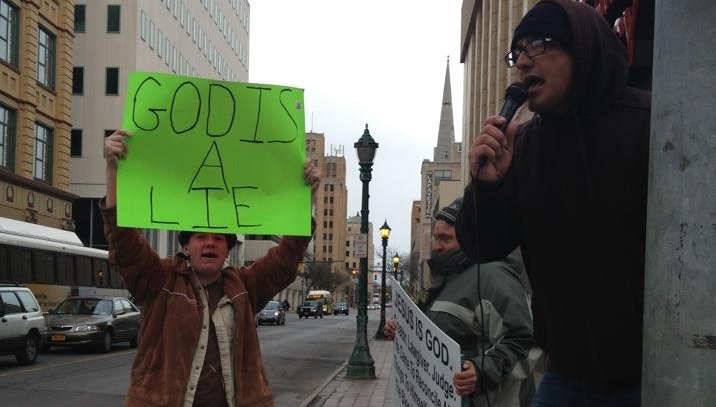 Long had been named as a defendant in the lawsuit filed by Michael Marcavage of Repent America and Mike Stockwell of Cross Country Evangelism. The evangelists had been prohibited from distributing gospel literature without advance government permission and were barred from preaching with the aid of amplification when they attempted to engage in evangelistic activity in Syracuse in April. After thoroughly exhausting all means to regain their rights, they asked the courts to intervene in the matter. In the first phase of the civil challenge, U.S. District Court Judge Lawrence Kahn released an order granting the evangelists emergency relief, noting that “Plaintiffs’ success on the merits of their First Amendment claims appears likely” and that the unlawful actions of the Syracuse Police Department warranted an immediate restraining order. “Defendants are not entitled to construct an inescapable legal dragnet that encompasses a broad universe of other speech,” Kahn wrote. “That amplified sound may … be regulated … does not mean that a police officer may be given free reign to incarcerate individuals engaging in amplified speech if the officer finds the speech—in his own estimation—to be ‘unnecessary,’” he added. Kahn also ruled that Long had wrongly applied the city’s bill and sampling ordinance by requiring the evangelists to obtain a permit in order to distribute Gospel literature. The evangelists had additionally sought a preliminary injunction against the enforcement of the ordinances until their constitutionality is ultimately decided by the court. The city assured Kahn that Long’s view of the cited ordinances did not reflect the entire police department. Marcavage and Stockwell highly questioned their statement, asserting that Long’s interpretation of the ordinance was indeed consistent with others within the department, including Police Chief Frank Fowler. They presented evidence from a telephone conversation that took place on May 25 with Sgt. Thomas Derby, who explained that amplified speech could be shut down due to a single complaint from an “annoyed” individual. “Based on my discussions with law enforcement, the officers interpret the ordinance in a cacophony of ways, and even after filing this lawsuit and obtaining a temporary restraining order, great uncertainty still remains among the officers with the Syracuse Police Department as to what sound levels are permissible and impermissible,” Marcavage wrote in an affidavit filed with the court. In Kahn’s order on June 5, he declined to issue the injunction as he believed that the city’s actions resolved present concerns as Chief Fowler had also reportedly issued a training bulletin to officers. However, the case will now move forward into a more determinative analysis, including further argument regarding the constitutionality the Syracuse noise ordinance.